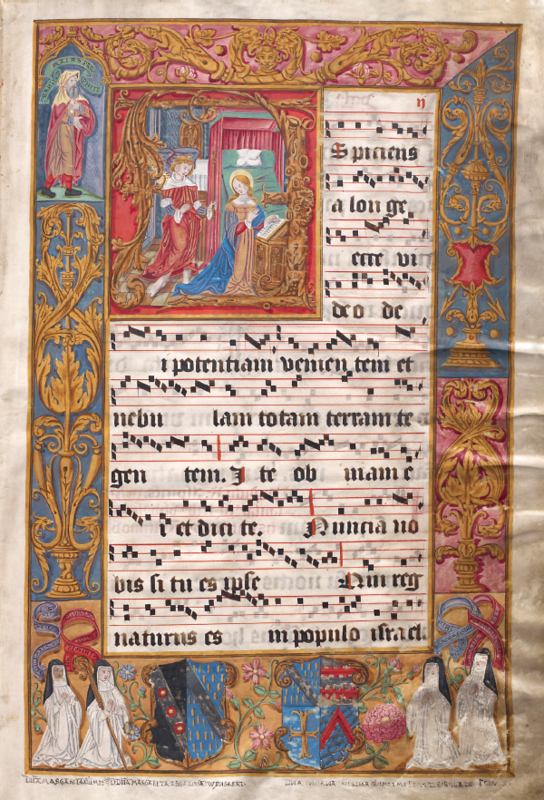 Since its discovery in 1998, and after years of research, analysis and conservation treatment, the magnificent Salzinnes Antiphonal is ready for its celebrated homecoming and first public exhibition. 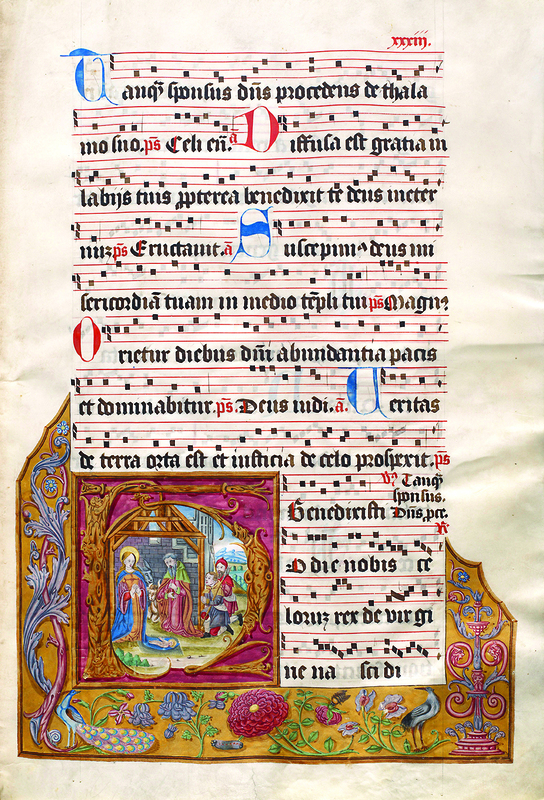 The Salzinnes Antiphonal is an illuminated choir book in the collection of the Patrick Power Library, Saint Mary’s University, Halifax. Originating from the Cistercian Abbey of Salzinnes on the outskirts of Namur, present-day Belgium, it was made in 1554-1555 for the former cantrix and prioress, Dame Julienne de Glymes. Hand-scribed on vellum using iron gall ink, the scale of the over-sized manuscript is breathtaking. A cultural artifact of international significance, the Salzinnes Antiphonal exhibits rare full-page illuminations; features multiple images of nuns and their corresponding inscriptions; records three separate religious orders; and illustrates patrons’ coats of arms. Unprecedented among antiphonal manuscripts, it serves as a hybrid record of commemoration, monastic kinship and communal devotion, and a dedicatory record to the de Glymes family as patrons. No other manuscript to date includes all of these features together in one book. The text, musical notation and illuminations combine to make for an extraordinarily rich document of a time, place and a specific group of women. This exhibition offers a once-in-a-lifetime opportunity to see a unique 16th-century artefact that transitioned from use in a European setting to its journey across the Atlantic to Halifax, Nova Scotia in the 19th century, where it continued to serve the faithful in a new context. The 19th century saw religious leaders in Canada travel to Europe to seek out objects of devotion to inspire the faithful back home. In an effort to connect the rich European tradition of faith to Canadian practice, Bishop William Walsh, the first Archbishop for the Archdiocese of Halifax, acquired and distributed artworks of veneration to deepen the spiritual life of Atlantic Canadians. The Salzinnes Antiphonal was likely acquired in France and brought to Nova Scotia by Bishop Walsh in the 1840s or 1850s. 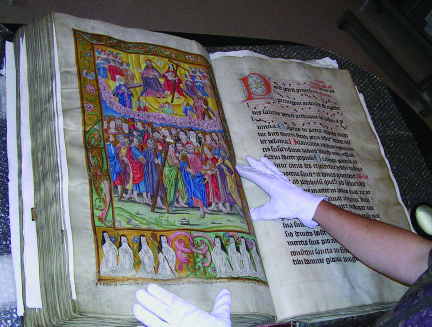 The manuscript remained a part of the Archdiocese collection until its donation to the Patrick Power Library at Saint Mary’s University by Archbishop James M. Hayes in 1975. Tucked away in Special Collections, the unidentified manuscript was discovered by Judith Dietz (then Manager of Collections at the Art Gallery of Nova Scotia) while conducting research for her exhibition An Expression of Faith: Sacred Art of Centuries Past. The find not only led to her Master’s thesis on the subject, but branched out to include its conservation and an ever-widening circle of expertise to search out and reveal its hidden mysteries. Engage with Centuries of Silence related programming and events. Interested in taking your Salzinnes Antiphonal experience home? 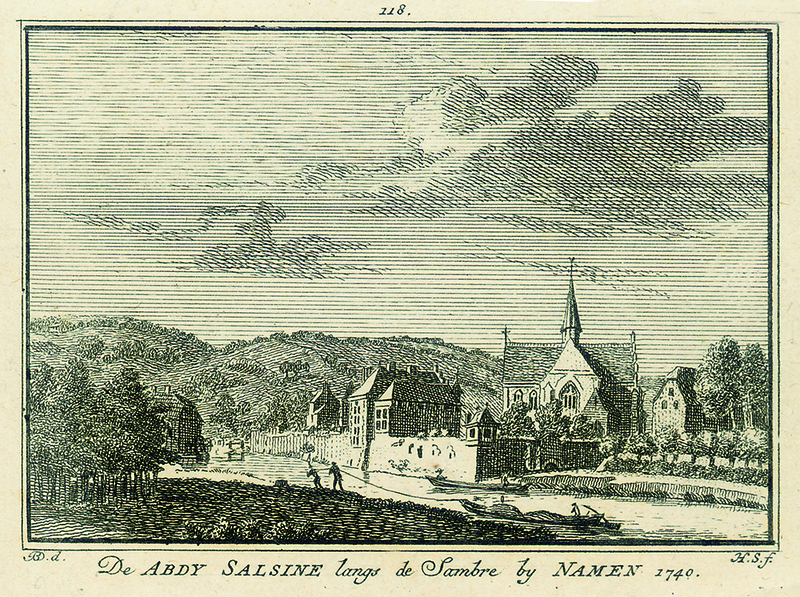 View the Salzinnes Antiphonal on the Alamire Foundation's database. Please note: Due to the high resolution of the images, the site can be slow to load.